During the School Holidays we offer the chance for families to swim for just £5. A Family Swim is based on 2 x adults and 2 x juniors or 1 x adult and 3 x juniors. Offer available at various times across selected YMCA pools. See Kids, Teens and Families timetables for time and dates. 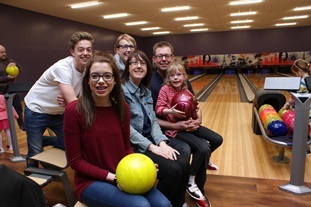 Time for some serious family fun at the Fylde Coast’s newest 10 lane, 10 pin bowl entertainment centre. Up to 6 people for 1 hour bowling. Located inside YMCA Thornton, the centre offers the latest bowling experience with action-packed competition guaranteed. YMCA Bowl offers the latest UV bowling experience with Glow-Bowl. During designated times only. Just £20 – Offer available all day every day! Find out why this new membership is so flexible for families and view the Family Membership checklist for everything that’s included in this new package: Y:Active Family Membership.